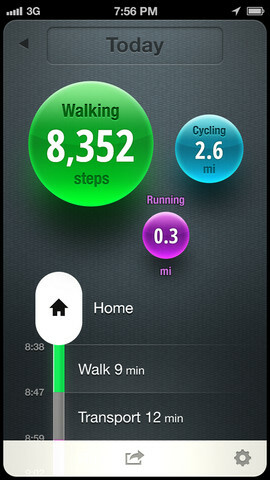 For those of you who don’t have the disposable income or the obsessiveness of a Quantified Self devotee to try every single smart pedometer out there like the Fuelband, Fitbit or Jawbone Up, there’s an app for you. I can scroll back day-by-day or week-by-week to see where I’ve been or how far I’ve walked. It runs in the background and hasn’t eroded my battery life. One time, even though I was off cell phone reception for nearly a whole day down in Big Basin Redwoods State Park, it managed to pick up about 6 hours worth of strenuous hiking. There have been one or two times in the past two weeks where it missed several hours of activity. (I’m not sure why.) But other than that, I’d say it’s been spot on. It doesn’t pick up other activities. So even though I dance and do martial arts many times a week, it won’t pick that up. Moves is from a Finnish startup called ProtoGeo Oy, which is co-founded by gaming veteran Sampo Karjalainen, who co-founded Habbo Hotel-maker Sulake. He’s a designer by trade that partnered with mathematician and scientist Juho Pennanen to create the company. Another co-founder is Nokia veteran Jukka Partanen. Karjalainen says he’s aiming for a much wider demographic than the one that goes out and spends about $150 on the Nike FuelBand. 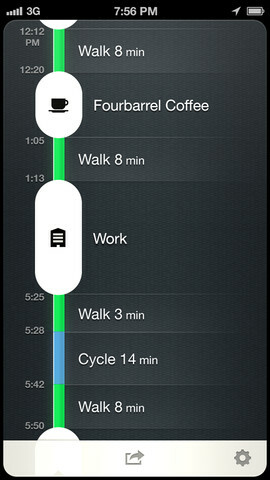 With the design, Karjalainen said he wanted the app to resemble a daily journal. It’s elegant looking, with spheres at the top representing how much you’ve walked, cycled or driven. Then there’s a vertical timeline below that shows all the stops you’ve made. “If you just make something visible, people react to it and become mindful of it,” he said. Later on, he expects to add other motivational loops on top of the timeline and tools for setting daily or weekly goals. The company has raised $1.6 million from ProFounders and early-stage Finnish venture firm Lifeline Ventures. He didn’t add specifics on how they’ll eventually monetize the app. It’s a proof of concept first, and if people are interested in it, they’ll figure out how to bring an app with similar capabilities to the myriad kinds of Android phones.